The Skinny: The "missing years" of uber-villain Sadako are traced in this effective and engrossing prequel to the lucrative Ring franchise. Review by Calvin McMillin: For movie studios, film prequels can be a veritable gold mine, since audiences seem to like the idea of moviemakers taking familiar characters and revealing new wrinkles about their past. But these sorts of films also carry with them the same danger that sequels do in that a lackluster prequel can effectively spoil the memory of a beloved original. Thankfully, that is not the case with Ring 0: Birthday, a fitting prequel to the Ring series. Though the film's tone is not quite in full horror movie mode, the results are no less impressive. Ring 0 pulls its audience in with an old-fashioned mystery plot that veers towards psychological drama. The film is essentially all about a good girl, who goes oh-so-very, very bad. After a brief prologue set in the present day, the film flashes back to a time thirty years prior to the events of the first Ring. Here, we meet a teenaged Sadako (Yukie Nakama), a frail, timid, but eerily beautiful new member of a theater troupe in Tokyo. Though she seems to have a good heart, Sadako is an outcast, failing to make friends and succeeding only in creeping everybody out. Well, everybody except for all-around swell guy, Toyama (Siichi Tanabe). Sadako intrigues the handsome soundman, who does his best to befriend the shy young girlmuch to the dismay of the other members of the acting troupe. But disapproving cast mates aren't Sadako's only problem. Unbeknownst to her, reporter Akiko Miyaji is hell-bent on tracking down our mysterious heroine, no matter the cost. Years before, Sadako's father and mother, Dr. Ikuma and Shizuko, put on a public demonstration of Shizuko's apparent psychic powers. But when the reporters suddenly turned against Sadako's mother, screaming at her and calling the woman a fraud, a journalist mysteriously fell down dead. 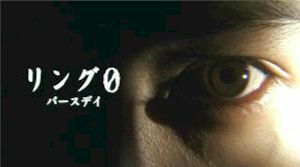 This man was Akiko's fiancé, and after learning that every reporter present at that event was eventually struck down, Akiko seeks vengeance on the one person she deems responsible: Sadako. Meanwhile, back at the theater, several people who had mistreated Sadako suddenly kick the bucket, which only further unites the cast members in their hatred and distrust of the meek young actress. For some reason, the death and disappearance of cast and crew isn't enough to deter the company from continuing with the play, which features Sadako in the lead role. And though it would seem that Toyama and Sadako just might succeed with their budding romance, the vengeful Akiko and a jealous rival construct a cruel scheme to expose Sadako on opening night. Though the results are tragic, the film doesn't conclude there, as we instead end up following the reporter, the troupe members, and even a grief-stricken Toyama as they head to the infamous cabin in the woods for the final showdown. Notes: Based on Koji Suzuki's novel, The Ring and the short story, "Lemonheart," which was one of three tales in the last Ring-related book, The Birthday.  The play that the acting troupe performs is an adaptation of the 1959 film Eyes Without a Face directed by Georges Franju. Retitled "Mask" for Ring 0, the film details the story of a doctor who kidnapps young girls in the hopes of using their skin to reconstruct his daughter's face, which was mutilated in a car accident.